The U.S. transportation system is heavily reliant on petroleum, a resource that accounts for 42% of U.S. energy-related carbon dioxide (CO2) emissions. Low- or zero-carbon fuel alternatives, like biofuel, can reduce harmful emissions while diversifying the resources we rely on for transportation. The development of domestic biofuel sources will also further reduce the amount of imported crude oil used in the transportation sector. Advanced biofuels are a promising, renewable alternative to fossil fuels, but with current technology it is not economically feasible to produce them in large quantities. To make advanced biofuels cost-competitive, the U.S. needs an abundant supply of inexpensive biomass feedstock. Expanded biomass production is limited by availability of fresh water, nutrients and land. By tapping into abundant ocean resources the U.S. could greatly expand the area available for energy biomass production. 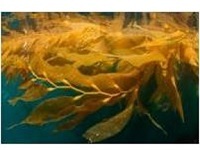 If successful, Marine BioEnergy would be able to grow giant kelp in open water to create an abundant and affordable feedstock for low-carbon biocrude. Increasing the production of domestic biofuels would help diversify the resources we rely on for transportation, thus further reducing dependence upon imported crude oil. The proposed technology would enable commercial biomass farming to be deployed in the open ocean, thereby reducing the demand for artificial fertilizer, land, and freshwater resources. Marine BioEnergy projects the cost of its biocrude to be competitive with conventional petroleum.